From the very beginning Williamsburg has been known as a ‘painter’s paint.’ The founder of the company, Carl Plansky, was first and foremost a painter by both temperament and training. Everything he made was infused with a painter’s sense of touch and passion for color. This passion for paint continues today as Golden Artist Colors carries on the legacy of Williamsburg Handmade Oil Colors. Using high quality pigments is just the beginning. So much of the quality of oil paint is in the grinding. With Williamsburg, each color is ground to enhance the beauty and luminosity specific to that particular pigment. Some colors will feel slightly gritty; others extremely smooth, preserving the wider range of differences oil paints had in the past. Cerulean Blue will have a beautiful velvet, light-absorbing surface with extremely strong covering power; the Siennas will often have a lesser grind and feel slightly gritty due to the larger pigment particle size. This grind allows light to travel through the vehicle, exposing rich golden or mahogany undertones instead of just heavy, dull browns. Williamsburg Oil paints are strongly pigmented and offer excellent covering power. 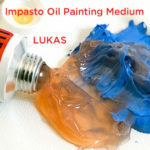 Most pigments are ground in pure, premium, alkali-refined and pH-balanced linseed oil, the most durable and flexible of the different kinds of oils. 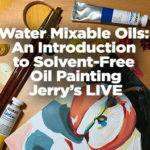 There is also a recently introduced line of colors ground in safflower oil, designed for glazing and the top layers of a painting where flexibility is less important and reduced yellowing over time is desired. Large selection of pigment rich Cobalt and Cadmium colors. A wide range of earth colors including Cyprus Orange, Turkey Umber, Native Italian Earth colors & French Earth colors. Modern pigments such as Quinacridones and Phthalos. Unique colors like Courbet Green, Montserrat Orange and Stil de Grain. 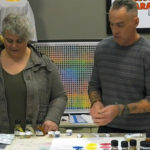 A line of transparent glazing colors ground in safflower oil.Special effect colors, with a range of Iridescent and Interference colors. Williamsburg Handmade Oil Colors continue to be used by some of the most recognized painters of our time, such as Milton Resnick, Susanna Coffey, Susan Rothenberg, and Julian Schnabel. Works created in Williamsburg can be found at the Metropolitan Museum of Art and MOMA in New York, the National Gallery of Art in Washington, D.C., and the Beauborg in Paris.